Whole black Malabar peppercorns. In a shaker jar. Black pepper paired with salt is ubiquitous on western tables. The spice we know as black pepper is the fruit and seed of a vine piper nigrum. The berries are cooked then dried. The black outer coat of the peppercorn is the skin and fruit of the berry. The white interior is the seed. 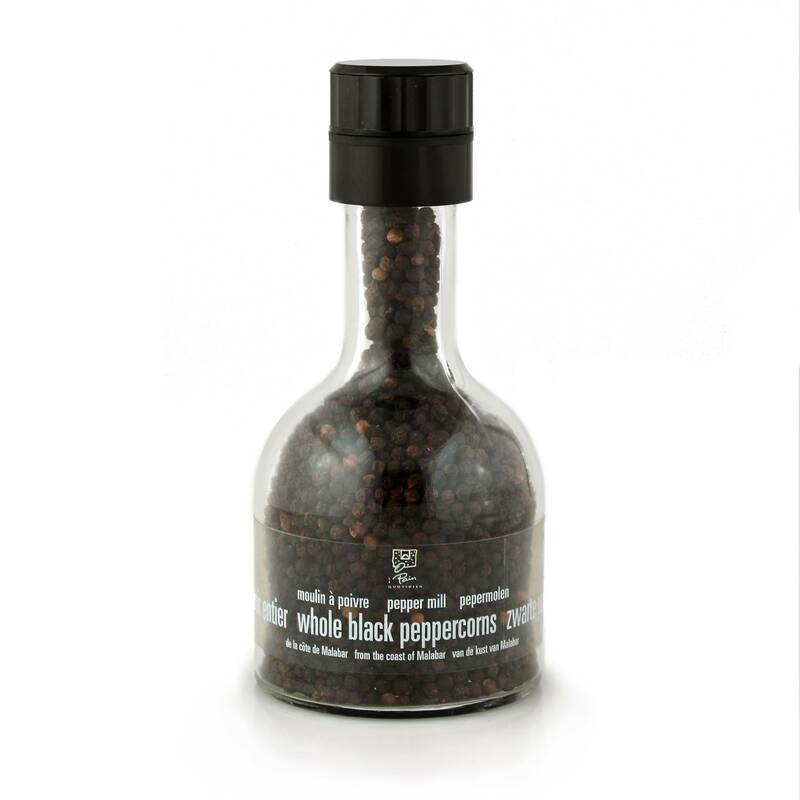 Our whole black Malabar peppercorns come packed in a glass bottle with a plastic grinding mechanism for fresh ground fragrance and taste. For millennia, the civilizations of the Mediterranean and Malabar, on Southwest coast of India, have traded black pepper. The spice we know as black pepper is actually the fruit and seed of a flowering vine called piper nigrum. The outer black coat of the peppercorn is the skin and fruit of the berry while the white interior is the seed. Our whole black Malabar peppercorns come packed in a glass bottle with a grinding mechanism for fresh-ground aroma and taste.